While the complexities of the Indian market increase by the day, the opportunity for fresh produce suppliers in this part of the world has never been greater. This came across very clearly to delegates at Fresh Produce India in Mumbai last week. 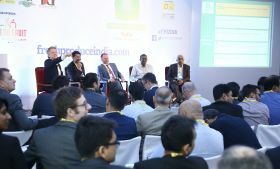 Held at the Trident Nariman Point Hotel on 26-27 April, India’s only fresh produce convention event attracted some 250 delegates from more than 20 countries. Dutta compared India to the EU in terms of diversity, population and languages. Referring repeatedly to the “patchwork of markets” that make up the Indian nation, he urged delegates not to take a one-size-fits-all approach when developing supply programmes. "Just because something happened in the past, it doesn’t mean it will happen in India, and if it does, it won’t likely be at the same speed,” he said. Despite the market’s intricacies, India’s trade potential is undoubtedly appetising. With a population whose average age is in the mid-20s, Dutta said India is home to one of the world’s youngest and most dynamic consumer bases. Dutta also pointed out the country’s growing middle class – which is now getting closer to the much touted 200m people – shows a willingness to pay premiums for branded products, with many mid-rung brands from Europe and the US classed as premium in India. Fellow panellist K Radhakrishan of Tata Starquik.com revealed that new varieties and products created new needs among Indian consumers. The country’s emerging modern retail sector is seen as a logical avenue to introduce new products to the masses. However, Radhakrishan said the reality doesn’t always match the expectation. “Retailers are currently eons behind the mindset of this country,” Radhakrishan told delegates. Modern retail was again in the spotlight during the afternoon workshop sessions on Day One. During the session ‘Purposeful packaging: from preservation to marketing’, Dr Gary Ward of Israel-based Stepac told delegates how his company is working to generate push and pull factors among Indian retailers and packhouses to encourage the adoption of modified atmosphere packaging. Srinibas Swain of Spar India followed Ward’s presentation with a discussion on how Indian consumers were beginning to comprehend the value that can be added thorough packaging. “All the product information is there on the pack, which helps consumers to understand the quality and freshness,” Swain said. India’s apple importers are prospecting for new supply sources to meet ever-growing demand, with the suspension of access for Chinese apples last June only intensifying the search. Another workshop on Day One turned the spotlight on two emerging sources – Turkey and Brazil. 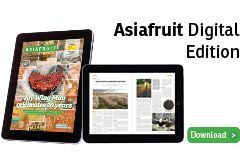 Pierre Pérès of the Brazilian Apple Growers Association (ABPM) spoke enthusiastically about the opportunities for the country’s high colour Gala and Fuji apples in India, noting that India’s demand for medium and smaller sizes made it an ideal fit for Brazil. Aysel Oguz of Anadolu Etap highlighted the gains made by Turkish apple exporters to India the past year, where shipments have doubled to 5,600 tonnes in 2017/18. But she also pinpointed an unprofessional approach as one of the key factors holding Turkey back. Gagan Khosla of Indian importer NGK Trading agreed, singling out consistency as the most important attribute for any new exporting country seeking to establish themselves in the Indian market. Fresh solutions to India’s cold chain challenge were the focus of another workshop, with Augustine Chalissery of SourceProcureDeliver and Ruchika Kuthari of Maersk India highlighting the need for an end-to-end approach, where distributors and marketers invested downstream and integrated with farmers. The opening plenary session to Day Two ‘Linking the chain: the future of Indian horticulture’ addressed this very issue. In the session – chaired by former Reliance and McDonald’s supply chain expert SD Saravana Gughan – Subhash Deswal of India’s largest carrot producer Sunshine Vegetables explained the keys to the company’s successful commercial farming operation while Sreeram Chellappa of agri-tech start up FarmLink discussed how it was tackling the challenge of aggregating production from India’s many smallholder farmers to forge ‘chain partnerships’ and consistent supply. They were joined in the panel discussion by Gopal Bihani, head of farm fresh at India’s largest food retailer Future Group, who highlighted the transfer of knowledge to farmers to increase productivity as one of the biggest challenges. 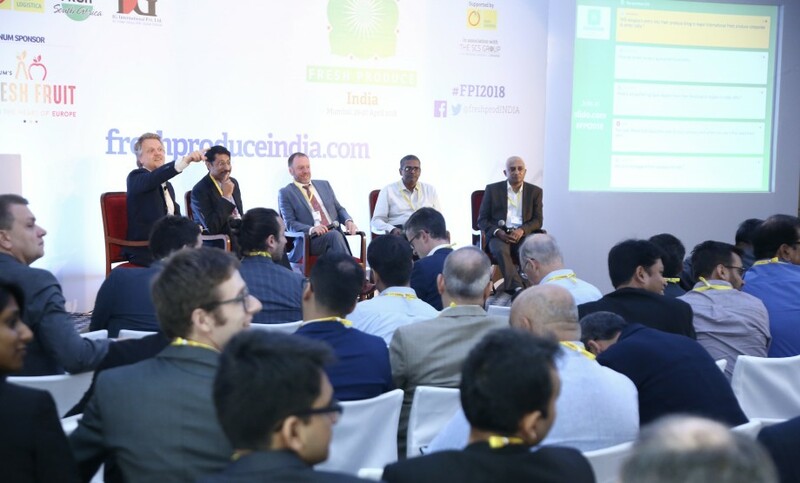 The lack of a robust farm-to-fork ecosystem is also one of the factors deterring private equity and venture capital investment in India’s fresh produce business, as a session on investment models for Indian horticulture highlighted on Day Two. Nevertheless, the two expert speakers – Asish Puri of Avalon Consulting and Kushal Agrawal of Aspada Investments – said horticulture was becoming increasingly attractive to investors, fuelled by a number of factors driving consumer demand. Delegates to Fresh Produce India had ample time to network at Fresh Produce India Expo, the business hub where companies from around the globe and across the supply chain showcased their products and services. Fresh Produce India Expo was also the stage for a number of launch events for Fresh Produce India sponsors. IG International and Stemilt Growers celebrated ten years of working together with the launch of Piñata apples at the Networking Lunch. The Chilean Kiwifruit Committee launched its first ever kiwifruit promotion campaign in India, together with import partners IG International, NGK Trading and Aayush Impex. And Platinum Sponsor VLAM – Fresh from Belgium – hosted the evening Cocktail Reception. Sponsors at Fresh Produce India also included Fruit South Africa, Fruit Logistica, NGK Trading, Suri Agro Fresh, Washington Apple Commission, From and GT Fruitech. Fresh Produce India concluded with a programme of tours, with a Market Track visiting Mumbai’s vast Vashi wholesale market and a high-end Big Bazaar outlet, and a Retail Track taking in Crawford Market and examples of street vending of fresh produce in some of Mumai’s upmarket neighbourhoods.